When you are on a multi-day trip Mode 1 - still provides a perfectly adequate amount of light, so you can now consider dumping the carbide or spare batteries as you can easily achieve +80 hours (for mixed power mode usage with predominately Mode 1 output) lamp run time from a standard Oldham battery. For normal activities Mode 2 is perfect and more than enough at 185 lumens! This is almost 4 times the light output of a standard Oldham 3W bulb, however due to the light output being closer to 'day light' and having a wider flood angle the perception of brightness is enhanced. If you require an extra amount of light then Mode 3 gives that extra illumination. 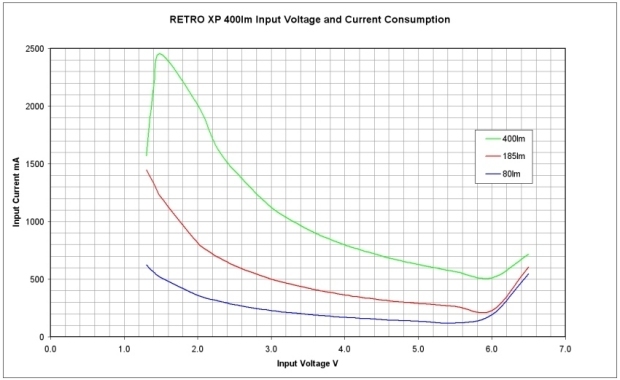 If you have a battery pack or cell combination that is not listed below it is possible to calculate the estimated battery run time, see: RETRO XP - Input Voltage / Current Curves. The table below lists estimated lamp run times for various battery packs. 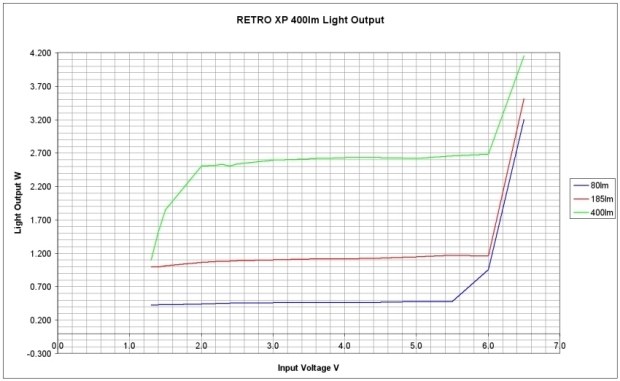 Light output is in Lumens (lm). 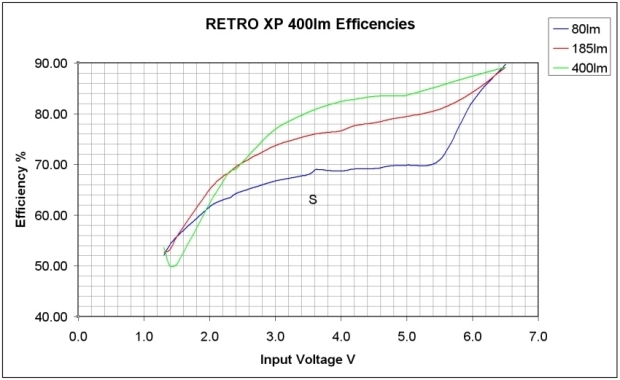 If a 3 cell NiCAD battery pack with a capacity of 6.5Ah is used to power the RETRO XP, then the total input voltage is 3.6V, this corresponds to a input current of 0.900A at 400lm, 0.408A at 185lm and 0.187A at 70lm, dividing the battery pack capacity by the input current and multiplying the result by 0.9 will give an estimation of the run time for a particular setting - 400lm = (6.5 / 0.900) x 0.9 = 6.5 hours run time, 185lm = (6.5 / 0.408) x 0.9 = 14.3 hours run time and 70lm = (6.5 / 0.187) x 0.9 = 31.3 hours. Using a switch mode power supply to drive LED's is more efficient than limiting the current with a resistor especially at higher powers (a resistor can only be used if the forward voltage of the LED's is lower than the batteries - in this case with two 1W LED's the forward voltage is around 6V). Where possible it is better to use a higher number of cells (higher input voltage) to keep efficiencies high and power loss to the minimum. Efficiencies over the whole power range (0.46 - 2.6W) for different cell combinations are: 2 cell battery pack (2.4V) 64 - 70% efficiency, 3 cell battery (3.6V) pack 69 - 81% efficiency, Li-Ion battery (3.7V) pack 69 - 81% efficiency, 4 cell battery (4.8V) pack 70 - 84% and a 5 cell battery (6.0V) pack 82 - 87% efficiency.